As we enter the holiday season, I want to thank all my new readers who discovered the site this year, causing an exponential growth in traffic, even as my posting schedule was more sporadic than 2010. 2011 was a considerable year for television exposure. In April, Holly Robinson Peete hosted a weekly series on CBS daytime program The Talk. Although her contract wasn’t renewed for this season, throwing a cloud of doubt in future features on that show, Peete highlighted a few groups often ignored in mainstream media coverage. Syfy joined the foray this summer with the drama series Alphas, featuring a group of people with superhuman abilities. One of the main characters is autistic man Gary Bell, portrayed by British actor Ryan Cartwright. Cartwright and the production staff took several steps to ensure accuracy in depicting the condition, and both will get more chances to display the disability as the show was renewed for a 2nd season in 2012. A lot of articles I discussed this year focused on brain research, including theories on unique brain maps of autistic children and the possibility of heavier brains caused by an overflow of neurons. Of course, such studies need to be flushed more thoroughly before they are accepted as widespread fact, but research will never cease. You can read more autism notables by clicking here. With my new position as autism bear writer for Examiner, I will be transferring some content to that site, including reviews of television or movies that feature some glimpse of autism, subtle or blatant. I will still dissect articles on this site, but will link them to Examiner for stories with relevant material. I have at least one more story to analyze before the calendar year is out, but it was a fun year watching my audience grow right before me. May that rise continue in 2012. 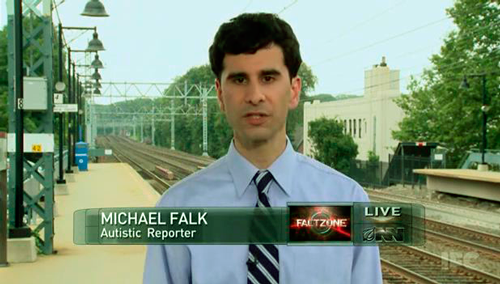 Intrigued by why my site received a spike in search traffic, I discovered The Onion brought back a well-known fictional character in the autism community: Michael Falk. Actor John Cariani returns for more lampooning for the fictitious Onion News Network, which airs Tuesday nights on IFC. In Falk’s latest “story,” he profiles a convicted felon who details the changes in lifestyle from a 40,000 square foot mansion to a tiny prison cell. However, the prisoner is dumbfounded when Falk is spellbound by a strict adherence to routine inmates must live by during their incarceration. The more details the criminal reveals, the more interest Falk has in a living condition with little to no room for ad-lib. The prisoner attempts to quell such interest to no avail as Falk declares his desire to join his subject in prison, oblivious to the warnings of emotional turmoil experienced by inmates who regret the crimes they commit as he fantasizes about the crates his guest has to stack on a daily basis. Falk even shrugs off embezzlement and fraud as taking too long to land in prison. (Un)fortunately, a myriad of ways exist to land in prison for a criminal charge. I shall not disclose those methods on the rare chance some crazed psychopath reads this blog post and draws inspiration to commit morally reprehensible behavior (and I have no intent on violating laws today, tomorrow, or yesterday). However, I can offer additional insights as The Onion was clearly not affected by the smattering of blog posts criticizing Cariani’s previous performances as mocking members of the autism spectrum. I received a recent comment on my first post on the Falk character. While some autistic people take offense to The Onion‘s portrayal, others in the blog world find Michael Falk amusing. Some even suggest Falk’s stories are a tongue-in-cheek parody where others who fail to grasp the condition serve as comic foils. An argument could be made watching all three stories featuring Falk, as all of his interview subjects are either left confused or offended by his blunt approach to communication. Mainstream media previously made such frustrations a focal point in their content, with the premise of Rain Man being Charlie Babbitt’s (Tom Cruise) struggle to adapt and accept the distinctive qualities of his autistic brother, Raymond (Dustin Hoffman). Autism Speaks’ controversial Autism Every Day profiled the feelings of hopelessness from parents of autistic children, and even traces of such concerns can be found in the Syfy series Alphas. Whatever the intent, The Onion is making its audience more aware of the disability by playing off common characteristics found in those diagnosed with autism. If the synopsis or video is not enough clarification, Onion News Network parodied the fixation on routines and repetitive tasks which autistic people often find enjoyable, sometimes at the cost of environmental surroundings (Falk doesn’t understand that going to prison is an event that should be avoided). Since the fake news organization has a mission statement of satirizing the follies of mainstream media and its subjects, interpreting Cariani’s latest performance beyond a comical look at an often-repeated symptom on traditional news outlets is difficult to theorize. For anyone concerned about an autistic person seeing this and taking the video too literally, recent news reports highlight programs and efforts to employ autistic people in favorable conditions, which include repetitive work details. You don’t have to find this or any other video funny, but it appears Falk will continue to appear as a recurring Onion News Network character. While a precedent has been set for expected emotional reactions to the fake stories, there are learning opportunities in a comedic format enjoyed by many consumers as opposed to the dry, heavy-handed presentations found elsewhere. Perusing through some autism links through various Google searches, I came across a video with an autistic reporter from The Onion’s fake news program, Onion News Network. ONN episodes can be watched on the Independent Film Channel or its website. If you’re not familiar with The Onion, its roots began in print and has expanded to other forms of media. All of its reporting is false and mostly a satirical look at the way we report and absorb real-life news. While that premise sounds similar to the fellow news satire program The Daily Show with Jon Stewart, the Comedy Central juggernaut bases its humor on true stories. Once you peel the top layer, exploring its inside reveals a fake story released in January where Michael Falk (played by actor John Cariani), the autistic reporter for ONN’s FactZone, is assigned to cover a gathering of crying people (better known as a funeral). The link I provided has an advertisement you must watch before seeing the story. Falk is insensitive to the feelings of others who are mourning the death of a Washington, D.C. woman, asking her mother how she feels about her daughter’s death despite the imagery and emotional display suggesting a tearful atmosphere (a play on lack of empathy, a common characteristic of autistics). Falk then provides statistics that would be irrelevant in an actual story as The Onion continues its attempt at comic relief. They include the color and number of buttons on the mother’s shirt, followed by rattling off Detroit homicide numbers to a city councilman, even though the story is taking place in Washington. Of course, Falk rarely establishes eye contact in his one-on-one interviews, another symptom associated with autism spectrum disorder. This was Falk’s first of two appearances so far on IFC’s Onion News Network show. Unfortunately, The Onion has not provided a link to his second story, where he fails to grasp the weight of a man run over by a train trying to save a woman’s purse. A YouTube copy of the video exists, which I linked here, but I can’t guarantee that clip will remain on YouTube. Mainstream press reaction was rather muted, but a few members of the blogosphere officially countered the assumption that autistics are emotionless. Landon Bryce of thAutcast.com accuses The Onion and IFC of bigotry in both video clips, and questions what exactly The Onion is satirizing when Falk returns for his train accident story. His concern is people who watch those stories will assume autistic people don’t place value on human life as other humans do, while fellow autistics who find this story amusing could be buying into the stereotypes. Falk’s stories ring a parallel to what I mentioned last year in a news aggregate research of The Big Bang Theory’s Sheldon Cooper, who many believe is autistic and led to the creators publicly refuting the idea in interviews. Because Falk has a stated condition before he presents his stories, The Onion may have removed the comedic value it was trying to provide by lampooning the social ineptitude we generally think of when we hear about an autistic person. Instead, they left the door open for criticism because they’re mocking a mental disability, rather than peculiar behaviors as Sheldon exhibits on CBS’ hit program. However, since The Onion is completely satirical, that may have shielded them from larger media exposure we would have seen had a more traditional news organization been accused of mocking autistic people. Mental disabilities have always been easy to poke fun of by comedians and comedic organizations because the symptoms stand out significantly compared to other human characteristics. The same reasoning can be applied for the increased likelihood of bullying against the mentally disabled, and that feeling could be behind the negative reaction to the Michael Falk character from some bloggers. I do have to credit The Onion for its accuracy in depicting the condition, but perhaps more thought was needed on why an autistic reporter character was included for their Onion News Network show. Bryce interpreted the videos as showing autistic people are incompetent of any task outside of what was exhibited in Rain Man, and his concern is valid with the low employment of autistic people in this country. You could simply rebuff all this by saying “It’s only a joke.” While the stories don’t display actual beliefs on what autism is, they do highlight the slippery slope of sensitivity that will arrive with the continuing saturation of autism in our country. The Onion would likely not satirize autism at all if they didn’t sense there was enough familiarity with the condition, and they may unintentionally provide the first lesson on how autism will be approached from a comedic point of view. Can't wait to visit The Autistic Journalist? Subscribe by e-mail!